Miskan is a small island situated nort-west to Failaka. Its longer axis has 1100 m, shorter axis 500 m. The highest point of the island is its western shoreline delimited from the east by a lowered terrain that makes a dune of the western shore even more distinct. In the centre of the island, another higher longitudinal (along NW-SE axis) ridge is recognizable that smoothly openes in slightly lower eastern shore. 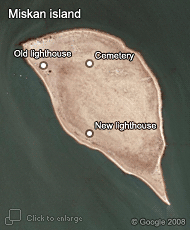 The oldest official documents about the island come from 1918 when the British established a lighthouse there ("old lighthouse" on the map) that was supposed to signalize to the ships passing between Failaka and the mainland to the Kuwait Bay. The lighthouse is still preserved on the north-western edge of the island. The family members of lighthouse's guardian are buried at the local small cemetery. Other – modern – lighthouse stands on the western shore of the island but is not working at the present days, however. KSAM launched a survey project in 2008 that could have been carried out only at the minor scale up-to-now when the past structures visible on surface were simply mapped by GPS and a preliminary map of the sites was created (mapped structures marked by black points, light orange spots and blue squares and lines). Common are stone concentrations - probably remains of past farmsteads and small buildings. Besides these, two large water cisterns were detected in the northern and one in north-central part of the island (blue squares). Water supply and drainage system is also recognizable in the field in a form of narrow furrows (blue lines). The highest concentration of occurrence of the past structures together with scattered pottery fragments could have been delimited in the central part of the island (hatched area on the map) that corresponds with topographically higher ridge. The largest stone concentrations (light orange spots on the map) were found at the south-eastern edge of this ridge. All the remains can be dated, according to the material scattered on the surface, to the Late Islamic Period and so be connected with the modern history of Kuwait. 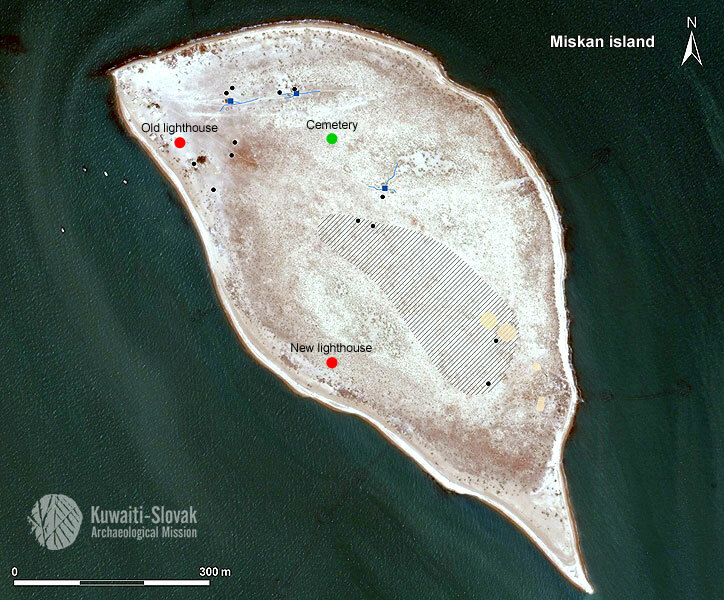 Click on a map to see archaeological sites on Miskan island (surveyed by KSAM in 2008).